Waverly wind farm in Coffey County, Kansas. "The continued growth of wind energy in Kansas has resulted in one of the lowest-cost sources of energy in the United States." That August 2017 statement from California-based Infinity Renewables (now ENGIE) was made on the occasion of Target Corporation agreeing to purchase 100 megawatts (MW) of output from Infinity's forthcoming 474-MW Solomon Forks wind farm on 50,000 acres in northwestern Kansas near Colby. Solomon Forks — employing up to 300 during construction and up to 20 in permanent positions upon completion — will be the fourth project that Infinity has developed in Kansas. It is also one of several wind projects proposed to be constructed in Kansas in 2018, which is currently ranked fifth in the nation for installed wind capacity, as one of only five states to surpass the 5,000-MW mark. Infinity operates three wind farms in Kansas (totaling 259 turbines) with three others in development, for a grand total of more than 2,600 MW (2.6 gigawatts or GW) of power generation capacity in the state. The central swath of the United States has been described as the Saudi Arabia of onshore wind. If that is the case, then Kansas is its fastest-growing refinery. According to WINDExchange, an online resource of the U.S. Department of Energy's Wind Energy Technologies Office, Kansas as of the first quarter of 2018 was home to 5,100 MW (5.1 GW) of installed wind power. The number pales next to the nearly 22.8 GW in Texas, but it's gaining rapidly on the 7.3 GW in Iowa — long regarded as the per-capita U.S. leader in wind power generation. And it's been a rapid rise from only 112 MW in 2001. How much wind power potential is there in the state? About 10 times the currently installed amount, says WINDExchange. Potential wind power capacity at 80 meters of altitude is 506 GW — good for fourth in the nation. So it's no surprise that wind farms in the state are on the radar of corporations looking to improve their renewable energy profile. In addition to Target, T-Mobile also has bought into Solomon Forks, to the tune of 160 MW, as it aims to shift to 100-percent renewable energy by 2021. Kentucky-based distilling giant Brown-Forman has signed up for 30 MW per year for 15 years from Solomon Forks. Other corporations hooked into the Kansas wind pipeline include Microsoft & Allianz, Yahoo, Google and MGP. Tradewind Energy was founded in Kansas, and has developed more than 1,300 MW of wind power across seven projects in the state. In March it sold the 300-MW, 95-turbine Diamond Vista project on 55,000 acres not far from Salina — to Enel Green Power North America. Among its PPA signees are three out-of-state entities: a power cooperative in Oklahoma; the city utility department of Springfield, Missouri; and Wisconsin-based plumbing fixture giant Kohler, which will buy 100 MW a year from the project. "The wind resource in Kansas continues to produce some of the country's lowest cost power, which is a tremendous value for our customers," said Rob Freeman, CEO of Tradewind Energy, Inc. In April, Tradewind earned the No. 1 ranking in the nation for wind energy developed and installed during 2017, according to the U.S. Wind Industry 2017 Market Report from the American Wind Energy Association (AWEA), developing 1,247 MW of the more than 7,000 MW of utility-scale wind projects completing during the year. Another wind developer making multiple bets in Kansas is EDP Renewables, which in February 2018 secured a 20-year PPA with Great Plains Energy for power from EDP's 200-MW Prairie Queen wind farm, expected to launch generation in 2019 in Allen County. That project brings EDP's wind footprint in Kansas to 600 MW across four sites. — Rob Freeman, CEO of Tradewind Energy, Inc.
Rorik F. Peterson, director of development — Central Region for EDP Renewables North America, has seen a lot of action in his 10 years in Kansas for the Houston-based company. And corporate end users are a growing part of it. Commercial and industrial customers are becoming "a significant component of our business," he says. In Texas the firm's farms serve the power needs of GM and Home Depot, among others, while Amazon is a major customer in Ohio. "In Kansas that possibility exists as well," he says noting that Yahoo is the main power purchaser from a wind farm in west-central Kansas. 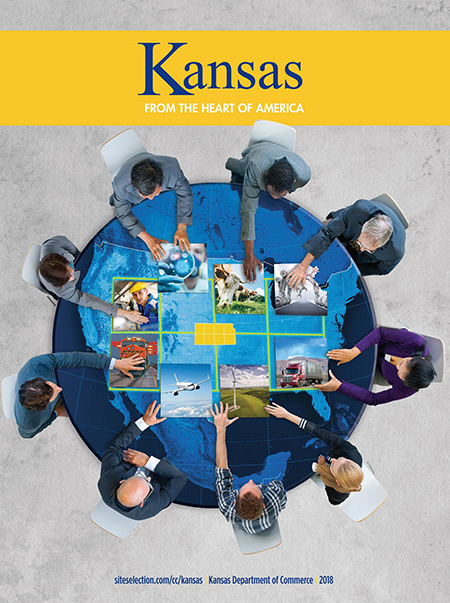 "As far as attracting business to Kansas, that certainly is relevant and applicable as well," he says from his office in the Kansas City suburb of Overland Park, Kansas. "One of the big stories over the past 10 years was in Topeka, where Mars Inc. constructed a large manufacturing facility. A significant reason for their locating there was the availability of renewable energy, because they wanted to make it a big part of their energy consumption. I firmly believe the continued evolution of renewable energy in Kansas will be a significant driver to large corporations and industrial entities to locate here, because it's desirable for them to source more and more of their energy from renewable sources. And the interest and willingness of utilities to make that available to them, they'll see as very attractive." Helping get the wind farms there in the first place were state policies like a mandatory renewable portfolio standard (RPS) that called for utilities to get at least 20 percent of their power from renewables by 2020, and a lifetime property tax exemption for projects. Those policies since have been replaced by a voluntary RPS and 10-year tax exemption. But that hasn't stopped the breeze from blowing. "When Kansas moved its RPS to voluntary in May 2015, we had already hit 20 percent of state power from wind, five years ahead of schedule, so it was a non-issue," says Kimberly Svaty, public policy director for the Wind Coalition, a wind industry trade association within the Electric Reliability Council of Texas (ERCOT) and Southwest Power Pool (SPP) systems. Not long thereafter, then-Gov. Sam Brownback called for the state to be 50 percent powered by wind by January 2019 — an ambitious, though not mandatory goal. "At the end of 2017 we were at 36 percent," Svaty says, "and we've announced several more projects since then. If we don't hit 50 percent by January 2019, we'll hit it really soon thereafter. The wind resource map shows the predicted mean annual wind speeds at an 80-meter height (the low-balled starting point for wind turbine heights).